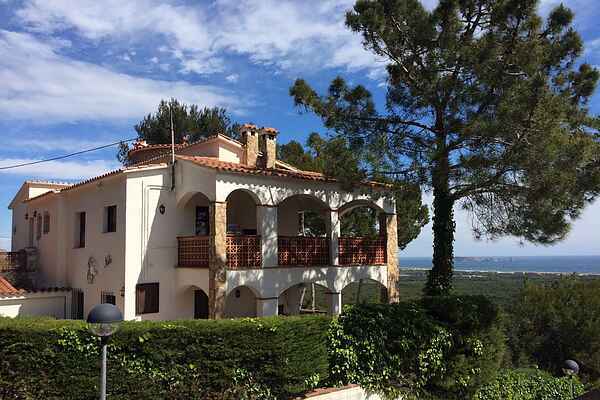 Holiday Villa in Pals with two separate apartments and a swimming pool, but is rented as a complete unit. The villa has 7 bedrooms and has a capacity for 14 people. On the lower level there is a (heated) swimming pool with terrace with sun loungers and a dining table. In the months of April to June and from September to November, the price of the heated pool (optional) is € 35 per night and is payable on arrival. The living area on the same level than the street is suitable for less mobile people. It has a covered terrace and a large open terrace with sea views. BBQ facilities, kitchen, living room, satellite TV and wifi. A double room with twin beds, a double room with a large four-poster bed and a room with bunk beds for max. three people. Two bathrooms one with shower and one with bath. The upper living area has a covered terrace with sea views and BBQ facilities and a terrace overlooking the sea. Modern kitchen, living room with dining area, sitting area, fireplace and satellite TV and wifi. One bedroom with twin beds, a children's room with two bunk beds and foldable cot, a room with a large four-poster bed and a tower room with two single beds. A bathroom with a shower and a bathroom with a bathtub.